One the greatest benefits of going live is increasing trust with your customers. Live establishes a strong level of humanization that is hard to achieve through your website, email newsletter, or even static videos. Through live video, brands have the opportunity to show their culture and passion for their work. You can be a little less polished so your audience can get a better sense of who you really are as a company. If you build trust with your audience, they will continue to buy from you and refer you to their network. Trust is a valuable currency these days, and through going live, you can make some hefty deposits into your brand bank. Live video generates real insights in real time. Each episode gives your brand actionable insights that you can fold into your business. Live video can even help draw the attention of current and prospecting clients to a business. At Experticity, I partnered with our existing clients to broadcast over 25 live episodes on Facebook. Over time, our other clients began to take notice and asked our sales team what it would take to participate in live video. Our sales team started to include live video in their initial sales conversations with prospects as an innovative way to position their brand to the end user. Here’s a live episode I did with our client LifeStraw where we answered questions from fans and demonstrated their product. Live video is the breath of fresh air we so greatly need in our newsfeeds that also plays in favor of the Facebook algorithm. Facebook announced earlier this year that videos that have high completion rates, and high engagement helps your content rank higher in the newsfeed. It takes practice, but as your brand improves its live video strategy over time, this tactic will help reach your audience through organic content. Facebook Live allows viewers to ask questions easily, react to live content, and share on their feed. A study by quintly found native Facebook videos (including Live) drove an average of a 1055 percent higher share rate than YouTube. Facebook Live makes it easy for the content to come to the user, rather than the user having to go search for it. Matt Wolpin from Juniper Networks joined the Social Pros Podcast and shared the success they are seeing from incorporating live video into their content strategy. He shares how they shifted their mindset from looking at social as a lead generation channel to more of an advocacy channel. They saw a 500 percent increase in link clicks year over year and a 200 to 300 percent increase in engagements after launching their live video program. Here is an episode from the Juniper Networks Facebook page where they interviewed a guest and took questions from their followers about the cloud. Take a minute and list out your fears. They may include a few from above, or you have a few to add to this list. Now, breathe. It’s going to be okay. I’m going to help you address these fears and share some tips to get you recording in no time. What if I make a mistake? If you’re trying your best but trip over your words a few times, your audience will forgive you. Remember: Live video is a way to build trust, and by being yourself, you can do that. Unsure about the Wi-Fi connection? Test! Before going live on your business page, try going live on your personal Facebook account. You’ll get a better sense of connectivity before you go live with your brand. Will anyone watch our live videos? I can’t answer that question, but you’ll never know if you don’t try. After five to eight live videos, assess your performance. Find what people were attracted to and what may have fallen flat. Address the insights, and pivot your content strategy going forward. I’m not comfortable on camera. I get it. Live video is scary. Think of it, instead, like Facetiming with a good friend for 20 minutes about a topic you both enjoy. Overcoming this fear comes with practice. You’ll feel way more comfortable on your tenth live video than you do on your first. If 1,000 people find value in your live video, there’s a good chance 100,000 will like it as well. Don’t take engagement lightly—if your audience is asking questions and enjoying what you’re sharing on Live, broaden your audience. If one of your live episodes performs well, this is a great opportunity to boost the video with paid media. Some live videos drive interesting conversations that you can also share with your email subscribers to amplify the content to a broader audience. When I started doing the live shows with Experticity, I was nervous that we wouldn’t see much engagement in the beginning. Early on, we were surprised with how much our audience enjoyed the shows and looked forward to upcoming episodes. It was as if we woke a sleeping giant in our content strategy. If live video is producing good results for your brand, other teams at your organization need to know about it. Live video can benefit various arms of the business by attracting new business, optimizing ad spends, and engaging current clients. You’ve seen the data. I’ve given you tips to overcome your live video fears. Now it’s time to hit record and go live. Below are four live video ideas for you to try with your business this month. Ask Our CEO Anything: In my career, any time I’ve included the CEO in the content strategy, the audience pays attention. CEOs are comfortable being interviewed which makes it easier for them to join a live video. They can share recent questions they’ve received and give a view of where the company is headed in the future. Join Our Great Debate: Identify two topics that you can pit against each other, and invite your audience to weigh in. Invite a guest to join who holds an uncommon opinion, and allow them to share their reasons for having that opinion. Your audience likely has an opinion, too—give them a platform to share it. Product Deep-Dive: I find the best live videos are about the most obvious topics that companies often forget about. Host a live video walking your customers through the product, and allow them to share feedback or their own experiences with your product. You don’t always have to create new and exciting content for live video. Meet the Team: I’ve gotten great results by interviewing employees. Whether they are on the product team or in customer service, they each have their own story and experience with the company that your audience enjoys learning about. This also shows off your culture which helps with recruiting talent in the industry. I’ve had HR tell me they see an increase in applications days after we do live video. 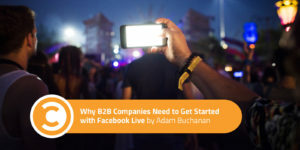 The qualities that make live video so popular with B2C brands—interactive, accessible, and personal—also make it a powerful addition to your B2B marketing toolbox. Why hesitate, when you could be connecting with your audience via such a candid, engaging new medium? Adam Buchanan is a digital marketing strategist with experience at Cabela’s, Columbia Sportswear Company, and Backcountry.com. Adam specializes in influencer marketing and has worked with over 2,500 influencers for brands. He is also passionate about social customer service and spoke on the topic at Socialmedia.org. He built the social media strategy for Cabela’s and Columbia Sportswear. At Columbia, he started one of the outdoor industry’s first brand ambassador programs with the mindset that these programs should be built upon trust and authenticity.